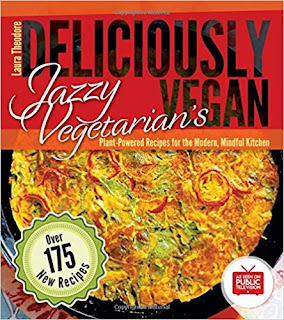 Years ago, I had the pleasure of being a guest on the Jazzy Vegetarian podcast, hosted by the lovely Laura Theodore. 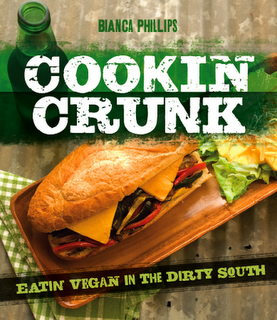 It was just before my book, Cookin' Crunk, came out, so it must have been around 2012. That was before Laura got her own vegan cooking show on PBS! Now she's a vegan superstar! 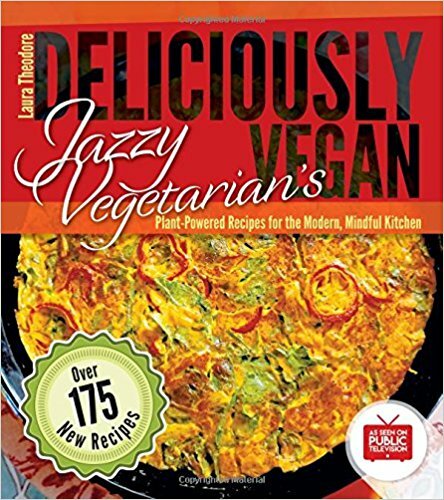 And Laura has a new vegan cookbook out — Jazzy Vegetarian's Deliciously Vegan — which her publisher sent to me for review. This is a well-rounded cookbook covering all the bases — breakfasts, baked goods, soups, salads, entrees, sides, and desserts. 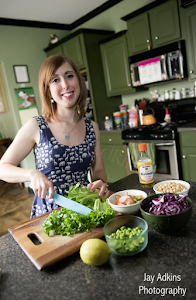 Laura's recipes are always easy and super-approachable, making them especially appealing for new vegans (and people who just don't want to spend hours in the kitchen). Plus, she focuses on whole foods as the base for most everything (with a few exceptions for occasional vegan cheese). I chose three recipes, two of which used very similar ingredients because I wanted to make sure I didn't end up with half a pack of unused this and that. I have a problem with choosing too many different kinds of recipes each week, and I end up buying a million things that don't get finished. I'm working on that! 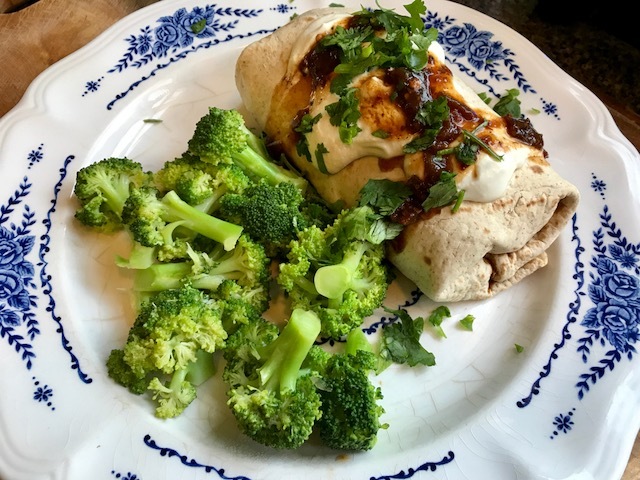 Last night, I made Laura's Vegan Black Bean Burritos with Tofu Queso Fresca and her Broccoli with Maple-Tamari Sauce. The burrito was seriously one of the best I've ever had. I typically make the kind of burritos that you throw together on the countertop and hold in your hand to eat, but this fork burrito was baked in the oven so the insides were super warm and the outside was lightly crisp. The inside is stuffed with black beans, salsa, baby spinach, tomato, and a homemade tofu queso fresca that added such flavor, thanks to cumin, turmeric, chili powder, and other spices. It's topped with Laura's cashew sour cream (whipped up in the Vitamix), cilantro, scallion, and chipotle salsa (from a jar). The broccoli is simply steamed and tossed with a combo of maple syrup, Bragg's (I used that instead of tamari because it's basically the same thing), and olive oil. Super simple and light side for this big honkin' burrito! To use up more of the tortillas and black beans, I also made her Cheeze-y Black Bean Tortilla Pizza. 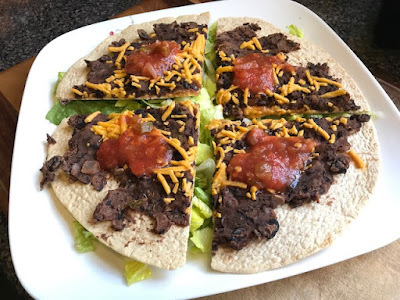 This quick Mexican pizza is topped with mashed black beans, vegan cheddar, and salsa. It's all baked in the oven until the tortilla is crisp, and then it's served over lettuce. Such a fast and filling weeknight dinner! I have plenty more recipes on my list from this book: Lasagna Muffin Cups, Baked Potato Tofu Scramble (one of three scramble variations in the book! ), Guacamole Mini Peppers (what a fun app! 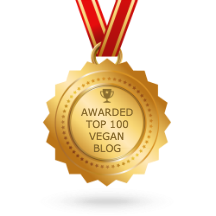 ), Chocolate Chip Oatmeal Bread, 30-Minute Veggie Tofu Soup, Sunny Black Bean Burgers, Seitan Fajitas was Cashew Sour Cream, White Chocolate Mousse, and the heavenly looking Divine Chocolate Mousse Cake. Looks yummy, I like that combination for dressing the broccoli. I also end up with so many bits and pieces of leftover things in my cupboards or my freezer. Trying hard to use them up! This sounds delicious! I'm always game for a burrito. I like to toast my burritos in the air fryer. I usually do it for 5 to 10 minutes at 400 degrees until toasty around the edges. It's great because I can put in the ingredients cold, which makes it ideal for leftover breakfast burritos. That burrito looks seriously amazing. I love hand held burritos but I also love saucy, eat with a fork burritos. I love the sound of bake potato tofu scramble!! Also lasagna cups, especially if they're easier than regular lasagna!! 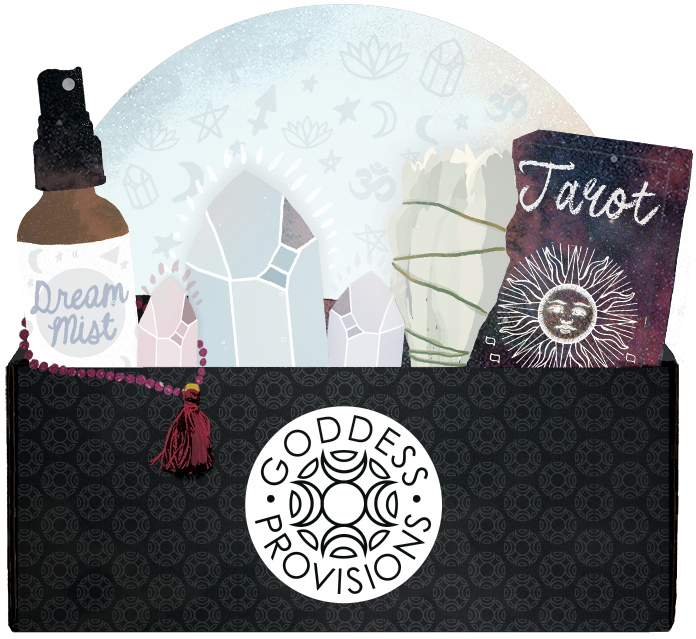 Happy First Anniversary, Mama Gaia! Vegan Buffalo Chick'n & Smoked Mozzarella Pizza!